GIANTS Software’s Farming Simulator 19 Fact Sheet Friday is back again, and this week they’re focusing on forestry! This shouldn’t come as a surprise to anyone, given that earlier this week GIANTS released a beautifully shot video featuring a mix between real-life and in-game footage of the Komatsu 931XC tree harvester and 875 forwarder. To go along with that video, this week we’ve got fact sheets on those two rugged pieces of forestry equipment, along with some additional pieces that will help you get your logs out of the forest and off to market. And now, on to this week’s forestry fact sheets! 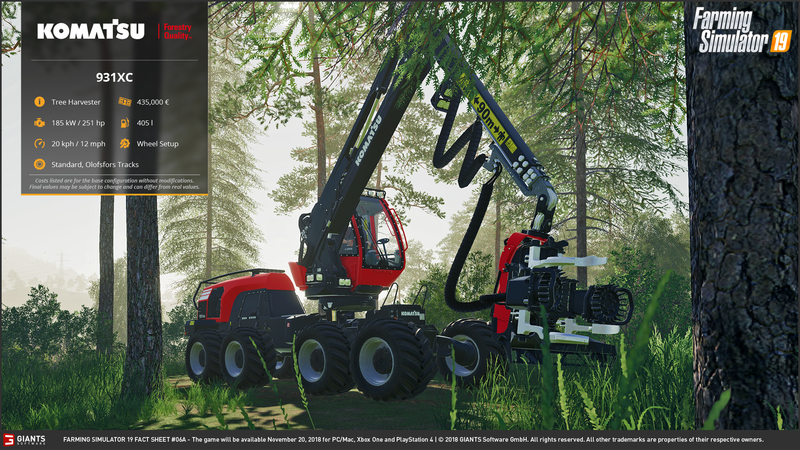 The Komatsu 931XC is a tree harvester very similar to the Ponsse Scorpion King, which was first featured in Farming Simulator 15 and returned in Farming Simulator 17. While it’s still unknown whether Ponsse equipment will return in Farming Simulator 19, it’s still worth comparing the two sets of equipment for the sake of argument. The “XC” in the Komatsu harvester’s model stands for “Extreme Conditions”, as the machine was designed specifically for use in difficult terrain such as loose ground and steep slopes. While the Scorpion King has slightly more horsepower (286 to the 931XC’s 251), the Komatsu machine is significantly more expensive, with a starting price of $435,000 versus the Scorpion King’s price tag of $317,000 (in Farming Simulator 17). The 931XC will offer the ability to choose between a standard wheel setup or Olofsfors Eco-Tracks. The Eco-Tracks website lists several advantages to equipping the tracks, such as less root damage, less maintenance, lower energy consumption, increased traction, and reduced ground damage and rutting. However, it’s unlikely that players will notice a difference between the two setups in-game – Farming Simulator 19 won’t feature any dynamic terrain, and I doubt that we will see any noticeable undergrowth damage. The Komatsu 875 looks quite similar to another piece of Ponsse equipment that was available in Farming Simulator 15 and 17: the Ponsse Buffalo. This machine can go deep into the forest to pick up the logs that are cut by the 931XC using its mounted crane. This is an excellent “all-in-one” solution, where one operator can drive the machine, then turn their seat around and operate the crane to pick up logs and place them in the bed. The 875 carries base price of $216,000 – slightly cheaper than the base price for the Ponsse Buffalo in Farming Simulator 17 ($221,000). 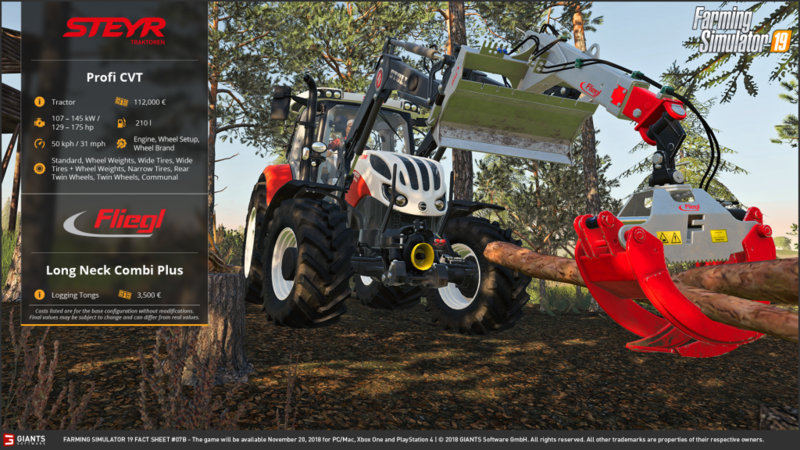 The 875, like the 931XC above, will offer the ability to equip it with Olofsfors Eco-Tracks, which are shown on the fact sheet. Again, this is likely nothing more than a cosmetic change in-game (even though the tracks have real-world applications), though there may be a slight difference in traction and turning with them installed versus the basic wheeled setup. MAN trucks have been in Farming Simulator games for quite some time, and they return yet again for Farming Simulator 19. This timber truck, however, is new to the game. Sporting a whopping 640 horsepower, this rig will surely move well even when loaded down with a truckload of logs. At $180,000 it’s not terribly expensive for such a powerful truck, and it even comes equipped with a crane at the rear to load logs without the assistance of another machine like the Komatsu 875, or a wheel loader or telehandler. It appears that this truck won’t offer much in terms of customization – there won’t be any option to select different sized engines, and the fact sheet explicitly states that the equipment shown cannot be bought separately in the game. Players will, however, be able to choose/change the colour of the truck. And with a top speed of 80 km/h (49 mph), this truck will quickly take your logs from the loading point to market to sell. Alternatively, given that it has an on-board crane, this truck could also be used to transport logs from the forest to a train depot and transfer them to the train. 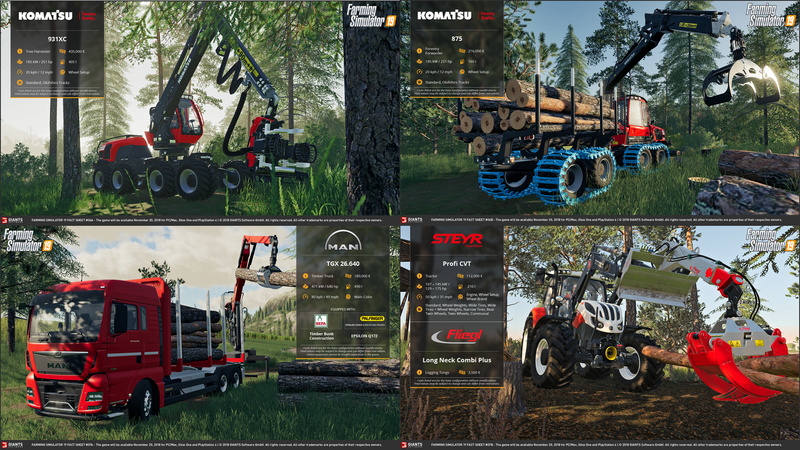 Steyr tractors have been featured in previous games as well, however the Profi CVT wasn’t part of Farming Simulator 17‘s vehicle roster. This appears to be a good small to mid-size tractor, with options ranging from 129-175 horsepower. Players will be able to customize this tractor in a myriad of ways, choosing the engine power, wheel setup, and wheel brand. In particular, there are quite a number of wheel setups on offer – nearly every possible setup you could think of is available. Players will also be able to choose which brand of wheels they would like to feature in their chosen setup. Most interesting to me with this fact sheet is the Fliegl Long Neck Combi Plus logging tongs setup. 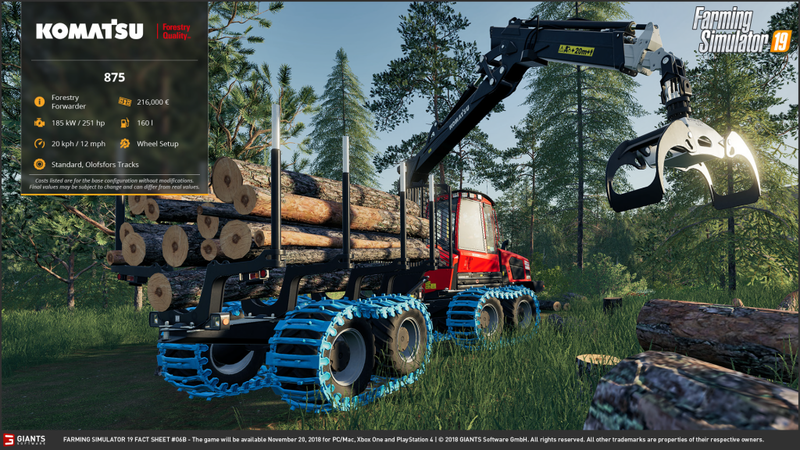 This piece of kit will attach to a loader arm to offer players the ability to move logs around with their tractors (rather than with the cranes attached to the equipment above, for instance). What is most attractive about this Fliegl attachment is that it looks like it will be much more useful than the standard log forks that we had to use in previous games. 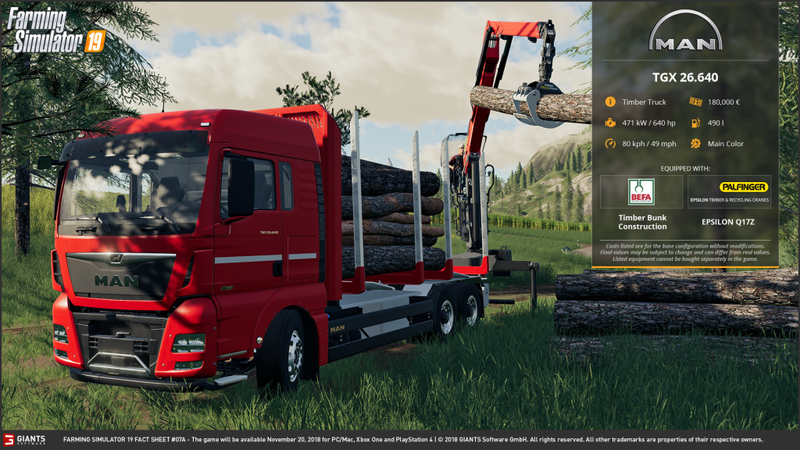 The added length of the Long Neck Combi Plus will allow greater flexibility in moving the logs, and it looks like this contraption will allow players to spin the logs as they see fit, making picking up and loading logs a much easier task than previously. As a general comment on all four fact sheets, I must admit that I am continually impressed by the graphical quality shown in these shots. The lighting and shadows seems incredibly realistic, and the textures of the trees and equipment seem greatly improved. Not only are we getting new and exciting equipment, but it appears that the game as a whole will be looking incredible! Scholarly Gamers will have more analysis when the next set of fact sheets is released by GIANTS, so make sure to check back each Friday for more!